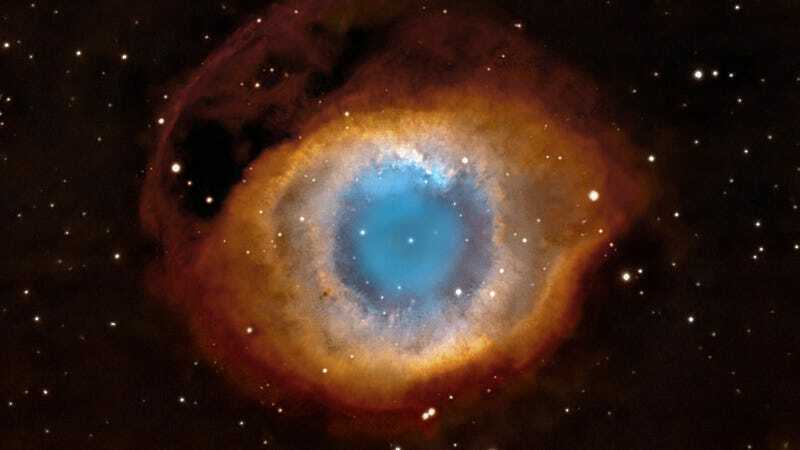 It's one of the most iconic celestial images in astronomy — the eye-like Helix Nebula. Ironically, the incredibly harsh conditions within this dying Sun-like star are producing a molecule integral for the formation of water, a process that could be repeated across the cosmos. Planetary nebulas consist of an expanding glowing shell of ionized gas ejected from old red giant stars late in their lives. The core becomes a hot white dwarf pouring out ultraviolet radiation into its surroundings. This radiation can be so intense that it can actually destroy molecules that have been thrown out by the star — molecules bound up in the rings of material seen at the outer edge of planetary nebulas. Astronomers surmised that this harsh radiation restricted the formation of new molecules in those regions. But it now appears that this is not only incorrect, it may contribute to a process that generates a molecule responsible for the formation of water, a molecule known as OH+ — a positively charged combination of a single oxygen and hydrogen atoms. A new study by Isabel Aleman of the University of Leiden, the Netherlands, shows that planetary nebulas, when exceeding temperatures of 100,000 degrees Celsius, produce OH+. "We think that a critical clue is in the presence of the dense clumps of gas and dust, which are illuminated by UV and X-ray radiation emitted by the hot central star," noted Aleman in an ESA statement. "This high-energy radiation interacts with the clumps to trigger chemical reactions that leads to the formation of the molecules." A separate study by Mireya Etxaluze of the Instituto de Ciencia de los Materiales de Madrid, Spain, focused on the Helix Nebula — one of the nearest planetary nebulas to our Solar System, a distance of 700 light years. This nebula, which burns at 120,000 degrees Celsius, contains a rich variety of molecules. Looking at Herschel data, Etxaluze's team found OH+ in locations where carbon monoxide molecules, previously ejected by the star, are most likely to be annihilated by the strong UV radiation. Once oxygen atoms are free from the carbon monoxide, they're able to make the oxygen-hydrogen molecules — a process that bolsters the hypothesis that UV radiation promotes their creation. These studies are the first to show how planetary nebulas may seed the cosmos with OH+, but the astronomers have yet to show that the conditions within would actually allow water formation to proceed. 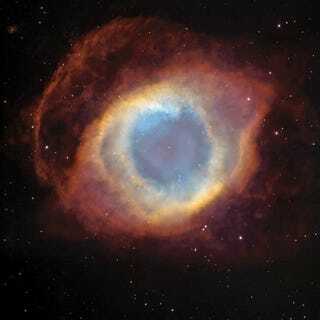 Read the studies: "Herschel planetary nebula survey (HerPlaNS). First detection of OH+ in planetary nebulae," by I. Aleman et al., and "Herschel spectral-mapping of the Helix Nebula (NGC 7293): extended CO photodissociation and OH+ emission," by M. Etxaluze et al., are published in Astronomy & Astrophysics. Supplementary source: ESA.